Sarah Filby fences an opponent. The sophomore helped the Wildcats to a 9-2 record at the NU Duals this past weekend. This weekend, Ryan Fieldhouse echoed with screams. The fencers were in town. The No. 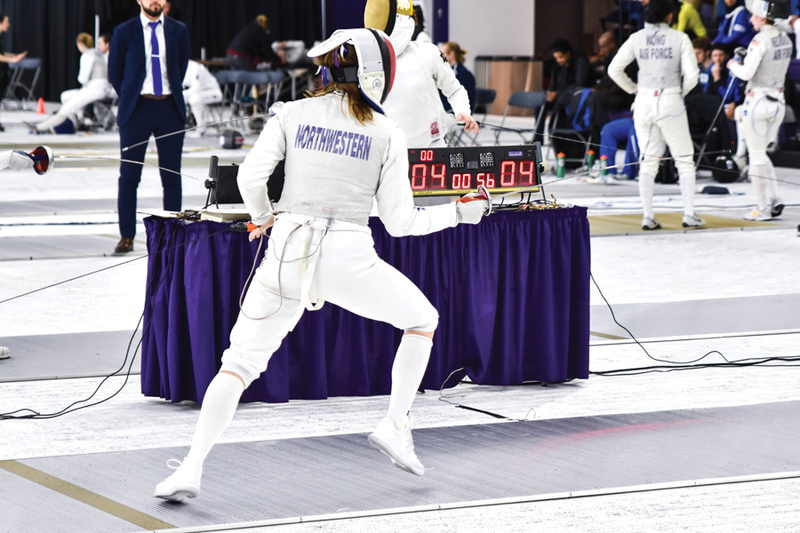 2 Wildcats hosted the Northwestern Duals this weekend, a two-day meet where the top talent in the country competed with clashing swords and yells of jubilation. NU faltered with two losses on Saturday, but rebounded to finish the meet 9-2, taking four wins over top-10 teams. The Cats (36-3) started the meet with a decisive 18-9 win over No. 9 Penn but then fell in tight matches against No. 1 Notre Dame and No. 10 Temple. They wrapped up Saturday with easy wins over Wayne State and Lawrence. Coach Zach Moss said it was important to keep things in perspective. Back at Ryan Fieldhouse on Sunday morning, the Cats leapt out of the gate with victories against No. 8 Duke, Caltech and No. 6 Princeton. Next up was conference rival No. 5 Ohio State with its star foil Camilla Rivano. Rivano, a sophomore from Italy, is an Olympic hopeful with two World Cup titles to her name. NU kept it tight early, as sabre fell 5-4. More and more fencers and spectators surrounded strips one and two, where the Cats were competing in epée and foil. By the time NU was down 13-12, a few dozen people were standing and shouting on each side. With a scream and a roar from her teammates, freshman Maggie Snider ended the epée matchup 5-4 for the Cats and tied the overall score. The match would come down to freshman foil Alyssa Chen against Rivano. The bout was already underway, and both sides were enthralled. “I could see my score, but I didn’t know how close the overall score was. I had a feeling, but I just tried to set that aside and just focus on getting that one touch,” Chen said. The Cats swept through Fairleigh Dickinson and Cleveland State to finish the day and the meet. The strictly collegiate meet was the first of its kind at Ryan Fieldhouse. University President Morton Schapiro dropped in to watch on Saturday, when the team’s seniors were honored before the match with Temple. The friends and family in attendance brought a different kind of pressure, senior foil Yvonne Chart said, but she was glad her friends had the chance to finally see her fence. Despite the extra fans, the team itself always cheered loudest. Chart said the vocal support of Chen during the last bout against the Buckeyes shows how well they’ve come together.